In 1941, Dr. Matthew W. Stirling, a non-LDS schalor, headed a joint expedition of the Smithsonian Institution of Washington and the National Geographic Society in the exploration of several archaeological sites of southern Mexico, including Izapa. At this ruin he discovered 20 carved stone monuments, to each of which he gave a num­ber. The one designated Stela 5 was the largest and the most ambitious sculpture found. 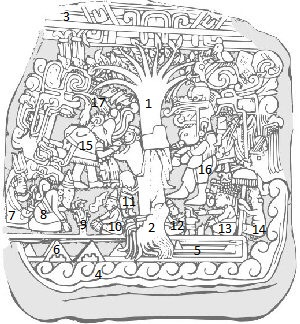 Stela 5, which is pictured here, has drawn the interest of Book of Mormon enthusiasts for many decades. Some Book of Mormon scholars claim that this 2,500 year old stone carving represents Lehi’s dream of the Tree of Life. Other Book of Mormon scholars have claimed that the stone has symbols which are similar to those found in Lehi’s dream, but that this is nothing more then a coincidence. Like with all archaeology, it’s relationship with the Book of Mormon is interesting, but not proven at this time or declared to be true from a living prophet. Still, the picture found on this ancient stone are nevertheless every interesting. 1. 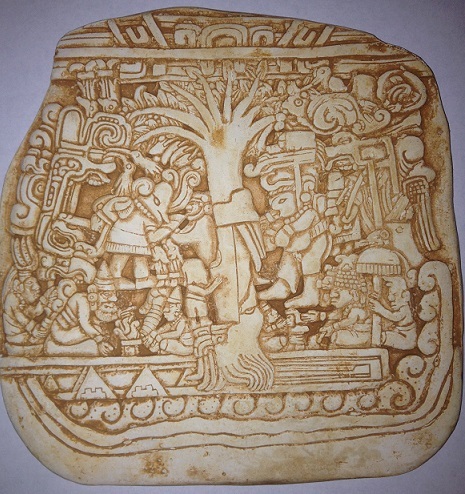 The central symbol of the carving is a tree. The tree is rooted in the earth, but reaches the heavens, thus connecting the earth with heaven. 6. This represents the earth, particularly vegetation or growth. The straight lines, if extended from these pyramid shapes, intersect the eyes and ears of each main character on the stone. 17. Birds representing resurrection, or the afterlife. You can now purchase a replica of the ‘Tree of Life Stone’. We have a very limited supply. Complete the form below and we will send you your replica of the ‘Tree of Life Stone’ and email you an invoice for $36 (includes shipping and packaging costs). Although interesting, it shouldn’t be claimed that Stela 5 was carved by Nephites or that it does indeed represent Lehi’s dream. We must wait upon clarity from prophets before making such claims.